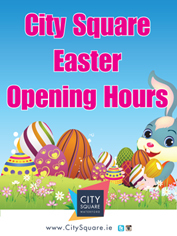 City Square is closed on Easter Sunday (27th March) but is open every other day over Easter. Here are the exact opening hours. As you can see Dunnes and Debenhams are open slightly later than other stores.